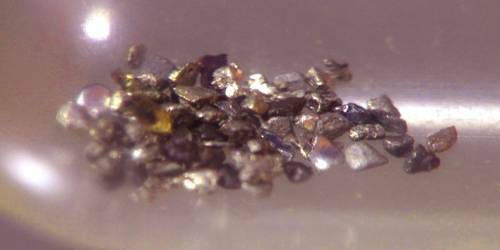 Laurite is an opaque black, metallic ruthenium sulfide mineral with formula: RuS2. 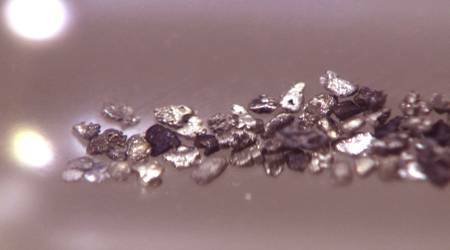 It is a mineral consisting of an iron-black ruthenium sulfide often containing osmium and found in minute crystals or grains. It is in the pyrite structural group. Though rare, it occurs in many parts of the world. It is rare sulphide of osmium and ruthenium found with platinum in Borneo and Oregon. It crystallizes in the isometric system. It is in the pyrite structural group. Though rare, it occurs in many parts of the world. Color: Iron-black; white to gray or bluish in polished section. Laurite has a Mohs hardness of 7.5 and a specific gravity of 6.43. It can contain osmium, rhodium, iridium, and iron substituting for the ruthenium. It occurs in ultramafic layered magmatic cumulate deposits and sedimentary placer deposits derived from them. Occurrence: In ultramafic complexes and in placer deposits. It was discovered in 1866 in Borneo, Malaysia and named for Laurie, the wife of Charles A. Joy, an American chemist. It occurs in ultramafic magmatic cumulate deposits and sedimentary placer deposits derived from them. Association: It occurs associated with cooperite, braggite, sperrylite, other minerals of the platinum group elements and chromite.